Have you ever seen a design and been so inspired that you feel like you’re going to explode if you don’t create something immediately afterward? Take that feeling and multiply it times 1 million. That’s how I felt after watching the movie Objectified with my design team. I was designing chairs in my head all afternoon, and REALLY wanted to run around stealing bicycle handles and sticking them on things. 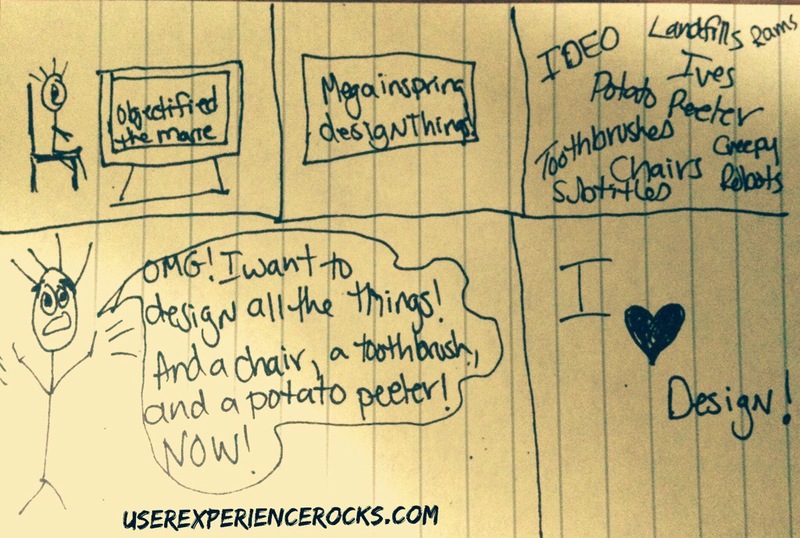 Not to mention how much I was dying to have a brainstorming session like the ones at IDEO. And toothbrushes? I can’t even. I loved every second. (Well, except for the seconds devoted to the creepy robots. Loved that it made me question what robots are, but the chick in the maid outfit with the blank stare? Yeah. One of the most fascinating aspects of the movie for me was the cross cultural passion the designers embodied. The passion and love for design that these folks broadcast so clearly crosses all language barriers. Unfortunately not available on Netflix Canada. 😦 I’ll have to fire up a proxy and try to see if it’s on Amazon Prime or not.